[ReTRIeVIA (for Year 2003/ 2004) will be back from 1 Jan 2008. Thanks for reading! Singapore has 4 official languages, so does it have a 4-language stamp? The response would be polite nods and words to the effect this would be kept in mind. 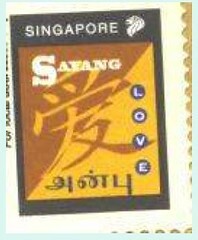 Just last night, as I sat idly poring over the Singapore Stamp Catalogue, I saw a 4-language stamp staring at me. How I could have missed it on all the previous occasions, I cannot understand. I guess it is a case of “You see what you expect to see; you hear what you expect to hear”. The stamp was issued in 1995 February. I think it is the only 4-language stamp issued in Singapore so far (and perhaps in the world as well). The theme of the stamp is particularly appropriate for Christmas. Well, here for your viewing pleasure is the attachment showing the stamp. May there be, “Peace on earth and goodwill to all”. Plant name beginning with ‘X’? Do you know of any plants whose names begin with ‘ X ‘? chrysanthus, commonly known as Golden Penda. Seok Hong then asked for plants with Common Names beginning with “X”. Well, I was stumped (no pun intended) and humorously said I don’t know whether there is a ‘Xylophone’ Tree. More recently, with Christmas round the corner, I thought of another tree that begins with the letter ‘X’. Here it comes —it is the X’mas Tree! Ha! Ha! Ha! You know the 4-Digit lottery is big business in Singapore. Whenever someone buys a new car, he/she is likely to place a bet on the number. Of course, once in a while somebody’s car number will win a substantial prize, and reinforce the hypothesis that a ‘new’ car number is ‘lucky’. Here is a special 4-digit number ‘1729’. No need to rush out and place your bets though. You may not think it is special but our Mathematics colleagues know it is recorded in mathematical history. The story goes that when the famous mathematician G.H. Hardy came to visit his sick friend, the Indian mathematical genius Ramanujan, he arrived in a taxi-cab. As a conversation opener, Hardy said to Ramanujan, who loved to work with numbers, that the taxicab he came in had a very dull and most uninteresting number, ‘1729’. 1-cube + 12–cube (1 + 1728), and 9-cube + 10-cube (729 + 1000). How Ramanujan could do all these mental gymnastics was just incredible. I wonder if Hardy had him what the next number was, that had such properties (being expressed as the sum of two cubes in two different ways), how Ramanujan would have answered him? One would expect that separating from Malaysia politically on August 9, 1965, Singapore would make all haste to become independent in all other matters. It would also be reasonable to assume that the separation would have resulted in great enmity. This was not so. Ah! But where is the evidence for this hypothesis. Look at these 2 stamp covers (there are many others available) and notice the dates of the postmark. You can see from the Singapore postmark-dates that as late as December 1966, sixteen months after separation from Malaysia in August 1965, Singapore was still using Malaysian envelopes and stamps! The first independent-Singapore stamps were the ones issued in August 1966 to mark the first anniversary of independence. The evidence shows that while independent-Singapore had its own stamps in August 1966, it still had the use of Malaysian stamps in December 1966. I guess we can say that while the 2 countries were politically separated they were still philatelically attached! When Indonesia was under President Habibie about 3 years back [Editor: In 1999], there was an instance when he got upset with Singapore and called Singapore a ‘red dot in a sea of green’ (or some other colour besides green; I can’t recall the exact colour). I attach for your viewing pleasure a First Day Cover that shows this very clearly.You can see the red dot in the small circle. Note also the words saying, “National Day” and the date ‘3rd June’ and ‘State of Singapore’. I think this ‘red-dot’ label should make Singaporeans realise that while Malaysia is a big neighbour, there is an even bigger neighbour and that is Indonesia. Just try this for size -the whole of Singapore’s population would maybe make up only about half of the population of Indonesia’s capital city of Jakarta! Indonesia has over 100 million! Not only in terms of population but in terms of land size too; as you can see, President Habibie’s analogy of ‘red dot’ is not too far off the mark! bedtime story to the child. This was a pleasant task with all the beautiful new storybooks produced nowadays for young children. One evening, the parents had to attend a church meeting so Grandpa was delegated with the job of reading to the toddler at bedtime. Having chosen the book Mummy settled the toddler to bed, told Grandpa to read the book loudly yet soothingly, and left quietly. When the parents got to the meeting place, they found that the meeting was canceled. They duly went home and walked quietly to the child’s room. There Grandpa was still reading the book, loudly but so soo-oo-thingly. Mummy peeped over his shoulder and saw that the toddler was fast asleep. Mummy: Dad, you can stop reading now. The little one is fast asleep. Grandpa: But I must keep on reading. I want to knowhow the story ends!